In 1913, revolutionaries in the north of Mexico revolted against the newly-installed regime of president Victoriano Huerta. The rebels, who took the name Constitutionalists, fought the Mexican Army for control of Matamoros, a town just across the Rio Grande from Brownsville, Texas. In response, the U.S. military increased its presence at Fort Brown, located in Brownsville. 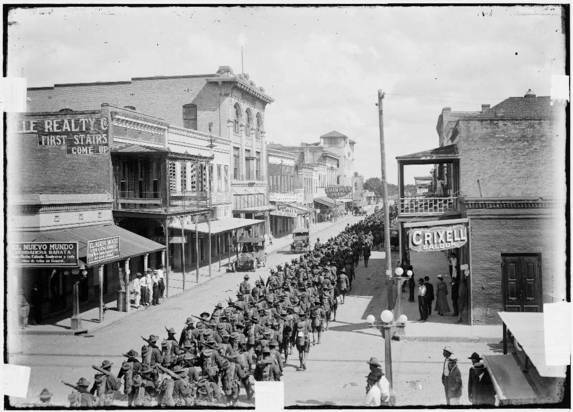 Photographer Robert Runyon took this shot of troops marching in parade formation down the streets of Brownsville. The U.S. would not intervene formally in the Mexican Revolution until 1916, when Gen. John J. Pershing led an expedition into northern Mexico to in pursuit of Pancho Villa, who had killed several soldiers and civilians in a raid on Columbus, New Mexico in March of that year. Source | Robert Runyon, "Soldiers Marching in Parade," Robert Runyon Photograph Collection, 02935, Center for American History, University of Texas at Austin, http://hdl.loc.gov/loc.award/txuruny.02935. Cite This document | Robert Runyon, “Soldiers Marching in Parade,” HERB: Resources for Teachers, accessed April 23, 2019, https://herb.ashp.cuny.edu/items/show/2291.